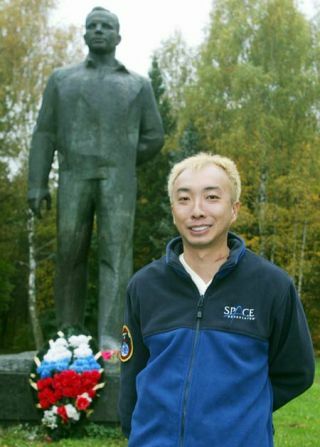 Japanese entrepreneur Daisuke "Dice-K" Enomoto will become the fourth private space tourist in October 2006. Japaneseentrepreneur Daisuke "Dice-K" Enomoto will be the next private space explorerto visit the International Space Station (ISS), the world's leading spacetourism company Space Adventures, Ltd. announced today. Enomoto, 34,will be the fourth fare-paying private explorer - and the first from Asia -sent into space by SpaceAdventures, following DennisTito, Mark Shuttleworth, and most recently GregoryOlsen, who returned from the ISS last month. Enomoto's10 day expedition, which will include eight days on the ISS, is currentlyplanned for October 2006. Like previous space tourists, Enomotowill travel to the ISS in a Russian Soyuz capsule, and he has already begun hiscosmonaut training at the Yuri Gagarin Cosmonaut Training Center in Star City,Russia. "I am proudto be the first private citizen from Japan to begin training for an orbitalspaceflight. I hope that by my interest in space exploration many others willbe encouraged to learn more about the mysteries of the black sky. For the past30 years, I have dreamt of seeing our Mother Earth from space," Enomoto said in a statement. "We areexcited to announce that Dice-K will be the next private space explorer tovisit the International Space Station," said Eric Anderson, president and CEOof Space Adventures in a written statement. "It will be another proud moment athis launch, not only for Space Adventures, but for Japan as a country. Weencourage people from all around the world to explore the final frontier. Wecongratulate Dice-K and wish him well in his training." Enomotois a self-described fanboy of the popular Japaneseanime series "GUNDAM" - a futuristic cartoon where humans wage battle wearinggiant robot suits. In previous interviews, Enomotohas said that with Russian approval, he would like to dress up as Char Aznable, a popular Darth Vader-like character on the show. A formerexecutive vice president and chief strategic officer of the IT company Livedoor and the founderof DICE-K.com, Enomoto now lives in Hong Kong andworks as an independent investor. SpaceAdventures is headquartered in Arlingtion, Va. withoffices in Cape Canaveral, Fla., Moscow, and Tokyo. It is the only company tosuccessfully launch private explorers into space and offers a variety ofprograms, such as Zero-Gravity and MiG flights,cosmonaut training, spaceflight qualification programs and reservations on futuresuborbital spacecrafts.